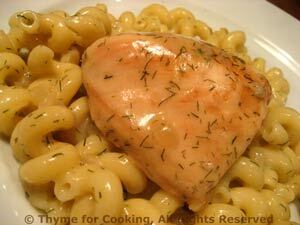 Chicken in Dill Sauce on Pasta, Thyme for Cooking easy midweek dinner. Cut chicken breasts in half the short way or into small pieces. Heat oil in a large skillet over medium heat. Add chicken and brown lightly, about 4 minutes per side. Add stock, wine, mustard, dill, cover and simmer until chicken is done, about 15 minutes. Put pasta in a bowl. Add some of the sauce and toss to combine. Top with chicken breasts, remaining sauce and serve.